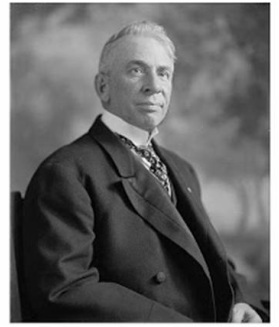 On April 19, 1912, less than a week after the RMS Titanic sank in the North Atlantic on April 15, 1912 with a loss of over 1,500 lives, Senator William Alden Smith of Grand Rapids, Michigan, presided over Senate hearings investigating the sinking of the Titanic. The hearings began in the Waldorf Astoria Hotel in New York City and later moved to Washington D.C. The day after the Carpathia docked with the Titanic survivors in New York City, Senator Smith, his fellow committee members, and witnesses and spectators listened to the stories of the remaining passengers and crew. Both in time and space, Senator William Alden Smith had voyaged a greater distance than the 13,000 foot journey of the Titanic to the bottom of the Atlantic Ocean 453 miles southeast of Newfoundland. Besides hanging around the depot to hear the trains, William Alden Smith sold newspapers to travelers and blacked the boots of returning Civil War veterans who told him soldier stories that made him cry. In 1872, when William was twelve, his family moved to Grand Rapids. Shortly after arriving in Grand Rapids George Smith became ill with a lung disease, the kind that afflicted many Nineteenth century factory workers and William had to go to work to support his family. He sold newspapers, delivered Western Union Telegrams and developed a popcorn business, “Will’s Popcorn,” that eventually earned him $75.00 a week – roughly double the average American household income of the time. During his Congressional service, William Alden Smith accumulated many accomplishments, standing boldly for fiscal conservatism and social liberalism. He championed the rights of black Americans by leading the Senate in approving the Emancipation Proclamation Exposition, fighting for the rights of black landowners in the South, and blocking a campaign to keep black women from voting. He investigated the effects of lobbying which he said could potentially undermine American democracy. Probably his most famous investigation was the committee he chaired that probed the sinking of the RMS Titanic. In his quest for the truth about the sinking of the RMS Titanic, Senator William Alden Smith vigorously fought against the steamship companies, conservative newspapers, and the British Board of Trade. Some of the Titanic’s surviving officers, especially Second Officer Charles Lightoller, never forgave Senator Smith for exposing their responsibility in the Titanic’s accident. The Marconi Company and the New York Times Company had colluded to monopolize and control the news about the Titanic, but Senator Smith’s hearing had made that impossible. Senator Smith went on to ask Fifth Officer Lowe if he had heard Fourth Officer Joseph Boxhall’s testimony about the composition of an iceberg and Fifth officer Lowe replied that he had not. Fourth Officer Joseph Boxhall and Senator Smith both understood that North Atlantic icebergs in April often contained rock and earth as well as ice. The question seemed laughable only to the scientifically ignorant. Senator Smith also asked other knowledgeable and pertinent questions about the North Atlantic including why sailors were ordered to keep a water temperature log and the meaning of a sudden drop in water or air temperature as had happened a few hours before the Titanic hit the iceberg. Senator Smith knew that the sudden water or air temperature drop meant that ice floes were present. Most of the surviving Titanic officers and men didn’t know this. Thanks to Senator Smith’s dogged, determined style the world learned that the binoculars of the lookouts had been taken away when the Titanic left Queenstown and they hadn’t received replacement binoculars. Surviving lookout Frederick Fleet testified that with binoculars he would have seen the iceberg in time to save the Titanic. Admiral Robert Peary testified that binoculars were essential in spotting ice floes at night. Senator Smith concluded that a law requiring that lookouts be supplied with binoculars must be passed. He also confirmed that ships needed to have enough radio operations and enough lifeboats onboard to accommodate all passengers, not just first class passengers. During the Titanic investigation, Senator Smith said, "What this nation needs is a severe lesson that will strengthen the pillars of its faith. We are running mad with the lures of wealth, of power, and of business. We are setting society into castes, with the forces of wealth and power on one side and destitution and poverty on the other. It takes a terrible warning to bring us back to our moorings, and to our senses." The Senate investigation into the sinking of the Titanic ended on May 25, 1912, and Senator Smith’s subcommittee issued a report on May 28th that led to significant reforms in international maritime safety. The new international maritime safely laws that came out of Senator Smith’s committee included improved hull and bulkhead designs, lifeboat requirements, better passenger notification, and better radio communications. Senator Smith’s action in seeing the hearings through from beginning to end had both positive and negative effects on American politics and the American psyche. The Senator’s persistent questioning of the predominantly British crew negatively impacted British American relations. It intensified the battle for the nomination for the presidency between William Howard Taft and Theodore Roosevelt, and loosed an avalanche of criticism onto Senator Smith’s own head. On the positive side, the Titanic Hearings were essentially the first public forum of the American people in the Twentieth Century, and the first time that a public corporation’s “customers” would make it accountable for its actions. Fifty three years after Senator William Alden Smith died at age 73, human eyes again gazed upon the Titanic. On Labor Day, September 1, 1985, Dr. Robert Ballard, chief of the Deep Submergence Laboratory at the Woods Hole Oceanographic Institute and his team of French and American scientists aboard a computerized Navy ship called the Argo discovered the Titanic. Dr. Ballard said in a statement: The Titanic itself lies in 13,000 feet of water on a gently sloping alpine-like countryside overlooking a small canyon below. Its bow faces north and the ship sits upright on the bottom. Its mighty stacks point upward. . . . It is quiet and peaceful and a fitting place for the remains of this greatest of sea tragedies to rest. May it forever remain that way and may God bless these found souls." References Lord, Walter. A Night to Remember. Bantam, 1997.